Target date funds (TDFs) are a reasonably good idea but with pathetic execution, at least so far. TDFs should end at the target date – a “To” fund – entirely in safe inflation-protected assets. “Through” funds that target death rather than retirement date are sold, not bought. They’re good for fund companies but awful for beneficiaries. Recordkeepers keep records. Financial engineers design Safe Landing Glide PathsTM. Common practices in TDFs are currently far from best practices. Fiduciaries choose TDFs, not plan participants. Qualified Default Investment Alternatives (QDIAs) should emphasize safety as retirement approaches. The transition period, from five years before retirement to five years after, is the most critical for maintaining lifestyle in the long run. The date in the target date fund name should mean something. “Through” funds have been concocted as (1) an excuse for the 2008 failure and (2) a grab at keeping assets longer. Participant behavior defies the retention objective because most withdraw accounts at retirement. “One size fits all” is a legitimate criticism. TDFs are not “right” for everyone, but properly constructed they can be better than participant choices. “Set it and forget it” can serve beneficiaries well. 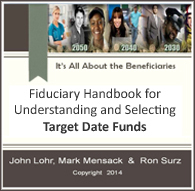 Enlightened fiduciaries choose the Safe Landing Glide PathTM provided by Target Date Solutions. If you believe as we do, please join our tribe and subscribe! by clicking the book cover below. © 2009-2019 PPCA Inc. All rights reserved. Target Date Solutions is a division of PPCA Inc.